I’m grateful for having been alerted earlier today (Thursday, February 23, 2012) to the following personal account by columnist, John Hoffmann, who writes for the on-line Chesterfield Patch and who also took the photo reproduced below. It’s a positive story about how the smoke-free air ordinance implemented back in January 2011 impacted one establishment and its customers, despite previous economic concerns. Of course, one example doesn’t prove anything but it’s nice to learn that bars can survive and thrive in a smoke-free environment, and everyone’s health benefits. 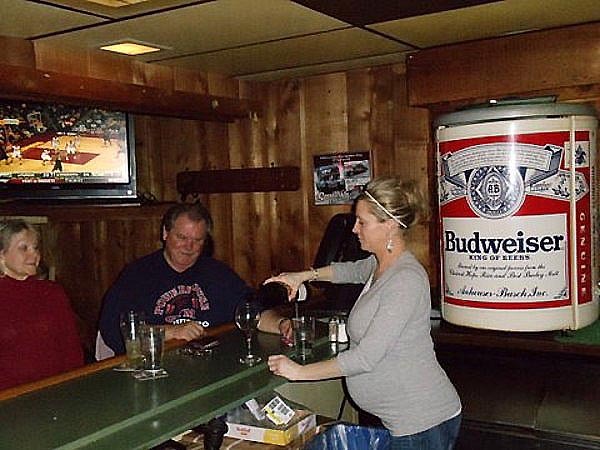 Return to Smitty’s: Has the Smoking Ban Helped or Hurt? A cloud of smoke used to hang in the air at Smitty’s. But now it’s gone and employees say thus far business is good. Bartender Christine Grgic pours a glass of wine for a customer in a smoke-free Smitty's. Before the countywide smoking ban went into effect, a cloud of smoke hung in the air. In November, I wrote about how I was looking forward to retiring my Smitty’s clothes after the St. Louis County smoking ban went into effect. The smoke was so thick when I ate there every Thursday that I had to wear clothes I could strip off and stuff in the washing machine the second I got home. Smitty’s, the neighborhood bar and restaurant tucked into the corner of the Baxter Bend shopping center at Clayton and Baxter Roads, is a lot like places that were on every other corner in South St. Louis 30 years ago. There is a bar on one side and tables for good food on the other. Before the ban, there was lots of smoke hanging in the air. When I spoke to her in November, bartender Christine Grgic predicted the smoking ban would mean more customers for both the restaurant and the bar. Nancy Seaman, a waitress during the week and bartender on the weekends, said she thought the ban would improve their dinner business but kill bar business. Last Thursday, I was at Smitty’s for my usual chicken fried steak with mashed potatoes. Instead of wearing a sweatshirt, I had on a cashmere sweater. I never would have considered wearing it to Thursday night dinner prior to Jan. 2. “It’s only been two weeks!” both Grgic and owner Don “Smitty” Schmitt said when I asked about the ban last Thursday. Both Grgic and Schitt said business is up so far. “I was damn worried when the ban passed. This is my steady income. But I have to admit last Friday night was the best Friday night we have had in 10 to 12 years,” Schmitt said. Grgic said the number of people who have come back or in for the first time because of the ban far outweighs the number of people who have stopped coming because they can’t smoke. There’s often a wait for tables on Wednesday for fried chicken night. But, Thursdays prior to 2011 weren’t that busy. I wanted to talk to Nancy Seaman last Thursday but she was too busy. Almost every table in the place was taken by 6:15 p.m. Seaman said in November she was worried about the effect the ban would have on business on nights a band was booked. “Anita Rosamond will always draw a big crowd on Saturday afternoons. But we were worried about the bands on Friday or Saturday nights. So far things have been great,” Schmitt said. A woman at the bar listening to our conservation interrupted to say she didn’t like the smoking ban one bit. “I am going to another place now so I can have a drink and smoke,” she said. I pointed out that she was still at Smitty’s. About this column: This article is the work and opinion of its author John Hoffmann. There are few, if any, scientifically documented studies that show that a smoking ban has had any impact on restaurant/bar sales. To be fair and “scientific” you must compare sales taxes collected and paid to your state (the most important measurement you can use) from the preceding year versus the current year. And also compare any “deviance” to other similar businesses in your area. (The casino industry loves to talk about “reduced revenue” despite the fact that the country just went through a severe recession and revenue for ALL were down.) When viewed truly scientifically, there is NO study documenting less revenue due solely to a smoking ban. The majority of diners want a smoke free environment, and given the choice to smoke outside versus going somewhere else, they’ll stay with their favorite. Comparing sales taxes paid last year to this, and then comparing to other “like minded” businesses, there will be virtually NO statistical deviation. And this applies across the country. Certainly a follow-up to this story would be interesting. However, as I’ve and others have said time after time that going smoke-free is not a bad business decision. There is a strong market for smoke-free bars and restaurants. There is also a market for smoking allowed establishments. Smoking bans affect the aggregate in a negative way. Some establishments may pick up business and some will lose. Some may scrape by and some will shutter. mogasp comment: There is a measure of agreement between us here but the one area of disagreement is that, when it comes to the health and welfare of either customers or employees, that is not a business decision: that is a matter for regulation, most appropriately either a health department or, if an ordinance is required, by government. Dave Godfrey, I have found a number of studies conducted by economists which find that smoking bans have harmed the bar and restaurant industry.